The northern section is now open and ready for action. This section, completed in summer 1999, runs north from Hanover Junction to York, Pa. Curently, parking areas are not complete along this section. The York County Parks Commission has now received permission to use the Drover's Bank Regional Headquarter's parking lot at the intersection of South Richland Avenue and Indian Rock Dam Road (near trail mile 19). The northern trailhead is located at the corner of Philadelphia St and Pershing Ave in downtown York (at the Visitor Center). Mile 11.5 - Elmers Grocery - Deli, Snacks. 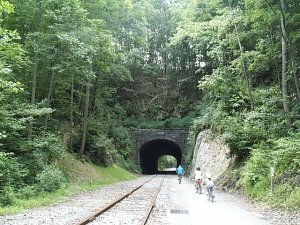 railroad tunnel in the US.